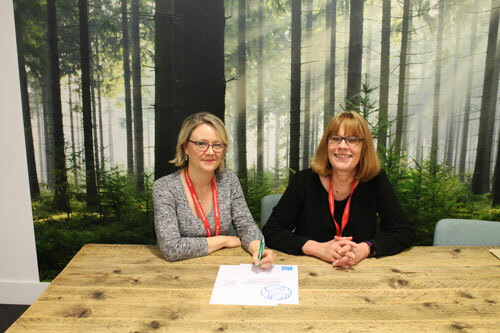 The Midwifery programmes in the School of Health Sciences at City, University of London have been awarded a Certificate of Commitment in the first steps towards gaining international recognition from the Unicef UK Baby Friendly Initiative (BFI) for a high standard of education in breastfeeding provided to midwifery students. The Baby Friendly Initiative, set up by UNICEF and the World Health Organisation, is a global programme which provides a practical and effective way for health services to improve the care provided for all mothers and babies. The Baby Friendly University Award was launched in the UK in 2008 – the first such award anywhere in the world – in order to ensure high standards of education in breastfeeding and relationship building are incorporated into midwifery and public health education programmes.Thanks to this work, breastfeeding initiation rates have risen by 20% since the Baby Friendly Initiative was established. The Certificate of Commitment recognises that a university is dedicated to implementing recognised best practice standards in breastfeeding education, and is part way along the road to full Baby Friendly Accreditation. In the UK, many mothers struggle to get breastfeeding off to a good start due to the pervasiveness of the current ‘bottle-feeding culture’ where facilities and support for mothers are inadequate, and where the power and business interests of the formula milk manufacturing industry takes precedence over public health gains. However, the research evidence of the health gains of breastfeeding both to infants, mothers and society is overwhelming, with recent research published in The Lancet challenging the misconception that feeding human infants on formula milk is without detrimental consequences. The staged accreditation programme also trains midwives to support mothers to breastfeed and help all parents to build a close and loving relationship with their baby irrespective of feeding method. While supporting breastfeeding is at the heart of the programme, the initiative aims to raise standards of care for all babies, regardless of how they are fed. For example, in Baby Friendly hospitals mothers and babies now routinely stay together in the immediate post-birth period, and all mothers are supported to respond to their babies’ needs for love, care and comfort in a way which promotes close parent-infant relationships and supports the mental health of both baby and mother. "We decided to work with the Baby Friendly Initiative to promote a high standard of education in breastfeeding for all student midwives graduating from this course. We know that many women give up breastfeeding before they want to because of difficulties which could have been prevented if skilled help had been on hand. By ensuring that our students are fully skilled in how to help a mother breastfeed her child, more women will be able to breastfeed their babies for longer.